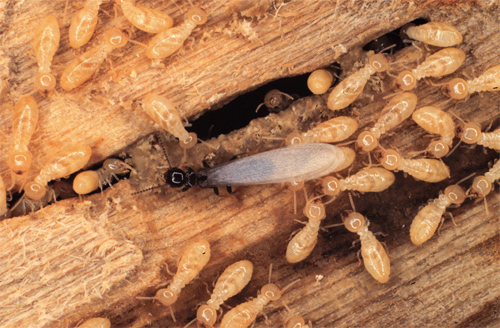 While you hope that it will never happen to you it is important to be aware of what termites are, the damage they can cause and how to control and deal with them. Termites will literally eat your house out from under you. One termite will take several thousand years to achieve this. Unfortunately you won’t have one; they generally live in colonies number thousands or even millions! A swarm of winged insects in your soil. Discarded wings on your floor. The best idea is to discover the following tips and exercise termite control before it becomes an issue. If you don’t you’re liable to be one of those property owners contributing to the $5 billion worth of damage caused by termites every year. Termites, like most creatures need water to survive. But they also need moist conditions to live in. The more moisture there is in your home the more attractive an environment it is to termites. Remove as much moisture as you can and invest in a damp meter to check the moisture levels in your walls. If it’s too high you’ll need to investigate further. Your fascia board and the mortar, particularly round your foundations is constantly under attack from pests and the weather. Inspect all of it every spring and repair damage immediately. This will deprive them of a way into your home. As mentioned water is an essential for any type of life. Termites are no different. To make your house less attractive make sure that all the water coming off your roof is effectively directed away from your home. This will prevent damage to your foundations and the creation of an attractive opening to the termites. Mud tubes in the soil near the foundations are a sign you have an issue. Any wood visible from the outside of your home should be checked regularly. This includes window frames and visible joists. If they sound hollow or you can see lots of tiny holes then you probably already have an issue. Get professional help fast! The same should be done inside your home. Any visible wood should be checked to see if it changes in appearance. If it does you’ll need to investigate further. Termites need to get to your home and they are not generally keen on crossing concrete. Soil against your house gives them the perfect opportunity to find a way to your wood and start munching. Prevent this from happening by creating an 18 inch gap between your home and the soil. This specifically applies to any wood on the outside of your home. Firewood is generally starting to rot and still a little damp. It’s very attractive to termites. If you stack it by your home then you’re inviting them in. Store it a minimum distance of 20 feet from your home to ensure any termites attracted to your firewood are not invited into your home. At all times you should stay vigilant. If you have any concerns investigate straight away and call for professional assistance. If you leave it you might find your home falling down round you.